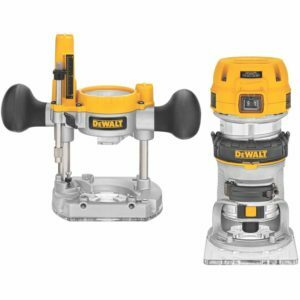 Dewalt DWP611PK is a two-in-one kit containing plunge and fixed bases. It falls into the category of laminate trimmer router. But it has some features that make it unique from other models of routers in this category. It will be a useful tool for woodworkers handling different applications or working in different job sites. The router is also suitable for people that work in a dark environment due to the fact that it comes with LED lights which shine intensely to brighten the material being cut. But there are more to be known about this product than this. Find out how unique it is from the rest of best wood router for beginners. DWP611PK can handle tough tasks thanks to its 1.25 horsepower motor which spins at a variable speed of 16,000 to 27,000 rpm. Due to its variable speed, operators are able to work on different workpieces. It has a variable speed dial from where you can adjust the speed to suit your requirements. As normal with AC electric motors, the motor of this router features a soft-starter. When the motor is starting up, its powertrain does not bear much load thanks to this feature which also reduces the motor’s electrical current surge. With the feature, the motor is subjected to minimal stress. Operators of this Dewalt router enjoy good control. First, handles offer excellent grip as they are contoured. Users will not suffer from hand fatigue during work. The position of the handles closer to the working surface also enhances users’ control. Its electronic feedback is another feature that improves operators’ control as it helps the router to sustain a maximal speed depending on the setting chosen by the user. The profile of router is available in a lightweight design and this gives more control to the users. Users can easily handle the tool for hours of work without subjecting themselves to heavyweights that will strain their muscles. It is a durable router with the motor housed in case made from aluminum. It is versatile as it can be used to handle different cutting tasks. The motor delivers good power to handle hard tasks. It is available in a lightweight and compact design. It has reliable dust collection system. It provides smooth plunge action. It only uses 1/4 collet and this reduces its versatility. It comes with only palm grip unless you are using the plunge base. The kit does not come with edge guide meaning that you have to purchase it separately. DWP611PK can be used by beginners and experienced woodworkers given its versatility, power, functionality and performance. It delivers quality, accurate and precise cuts. Thus, it is a good value for money if you can cope with the few drawbacks mentioned above.